What's The Buzz? Tell Me What's Happenin! It's a special game day version of What's The Buzz and boy, have Pens fans been talking. Crosby, Hartnell, Malkin, Neal. 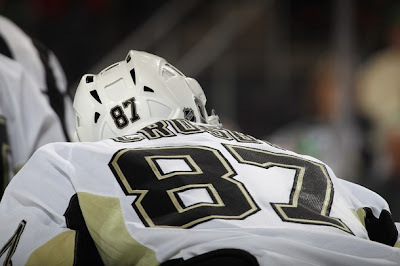 Here we go..
Sidney Crosby returned to the game March 15th against a first place New York Rangers team. Although it wasn't as picture-perfect as his first return to the game this season, Crosby racked up 4 assists to help lead the Pens to a 5-2 win. Since returning, Crosby has 9 points (all apples). To say Evgeni Malkin hasn't been near spectacular this season is nuts. Geno leads the NHL with 95 points (45G, 40A) and has an 11 point lead over Steven Stamkos and a 10 lead over Claude Giroux. Malkin is now only 5 goals away from Steve Stamkos for lead league in goals scored. 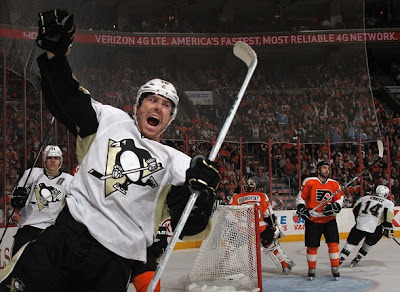 Along side Evgeni Malkin and Chris Kunitz, James Neal has been doing his fair share of contributing. Neal scored his first hattrick since joining the Pens against the Winnipeg Jets this past Tuesday. He recently recorded a career-high 4 assists in the Pens 5-1 win over the Nashville Predators. Hartnell down...with the Pens streak. Scott Hartnell downed the Pens 11 game winning streak this past Sunday scoring the game winner in OT. With that we still say.....1975. With the Pens scoring 30 goals in their last 6 games, there has been quite a few news stats. Marc-Andre Fleury picked up win number 40, Pascal Dupuis extended his point streak to 8 games with his 22nd goal of the season, Matt Cooke scored his new career-high 17th goal of the season, Brad Thiessen has a 3-0-0 record, and Malkin picked up goal number 200 against the Jet. Have a subject you thought needed some recognition? Put your buzz in the comment section below! Tonight it's the Pens and the Sens!